In a reversal of first quarter the Mosquitos had all the possession but failed to capitalise. When the Mozzies play with purpose they are very dangerous but at times try to do too much which comes undone. PNG failed to make the most of their opportunities with two shots spaying wide, a rushed behind and a couple of balls cleared off the line. Ireland have mounted a number of good rebound attacks which failed to result in a major due to superb defending efforts. Ikupu started to dominate around the ball using Simon and Peni to set up advances. 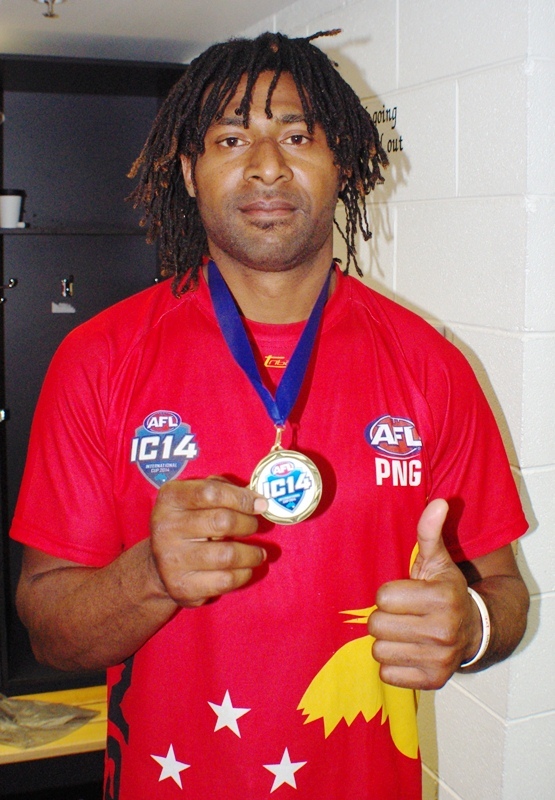 Beno looked the most dangerous forward for PNG with Pirika playing second fiddle. But it was Jason Soong who kicked PNG’s only goal for the quarter snapping truly on his left after roving from the boundary side of the pack. PNG players kicking for goals appeared to be fooled by the 50m arc distance as opposed to the 40m arcs at Royal Park seeing kicks for goal dropping short. The ledger appears more balanced at half time although Ireland holding that 5 point edge. Ireland looked like asserting authority early in the second half as the big men in Lucey and Finn dominated with simple lead mark footy into their forward line. But they failed to capitalise with kicks going wide. Eventually a mark in the pocket was taken by O’Regan who dished off the quick hands to Sean-Paul Henry for a running goal. Allan Farrell in the last line of defence for Ireland at the other end was reading the flight of the ball very well as PNG looked to press on the turnovers taking multiple marks for the quarter. Mick Finn was marking and tackling and looking like the match winner we know he is. But as the quarter wore on though PNG’s teamwork improved and they tried to manufacture breaks throught the corridor which only fell down once the ball was close to goal. Eventually Agita snagged one from Ikupu’s tap down in the pocket for a goal. PNG had a few more chances including Wartova’s kick after the siren. A narrowing 3 point lead to Ireland at three quarter time. To start the final quarter PNG pushed forward again but Farrell continued to deny them. But the next entry saw Wayne Reilly fend off to Gavuri’s face and he received the free kick. His pass to Brendon Beno in pocket for goal was marked and goalled. Mick Finn stepped up again for Ireland, as he marked the kick to the pack from centre and goalled from 50m out in front. The ball went from end to end with Brendon Beno’s snap going out of bounds on the full, Padraig Lucey’s kick going wide for Ireland and Ema Wartovo also kicking wide. Sean-Paul Henry almost pulled off a great intercept that would have left them open to score but was shut down. Breaking the deadlock was Ikupu who took a flying mark from a nice kick into the hotspot fromLaurie Logo. He went back and kicked the goal from 12m out. Gideon Simon then added one from a free kick 20m out from goal straight in front to give PNG a 9 point buffer with the clock running down. Ireland had one last gasp left in them when they needed two. O’Regan kicked a quick pass from the wing to Lucey and he kicked Ireland’s final goal with 30 seconds of time left on the clock and no time on to help them. 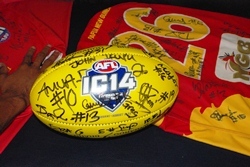 In the final contest the ball dropped in the middle of the pack and a quick kick out to the PNG 50m arc the ball fell into space as the siren sounded. PNG had battled long through the match to peg back the lead given up very early on. In the end they had more of the running as Ireland slowed. 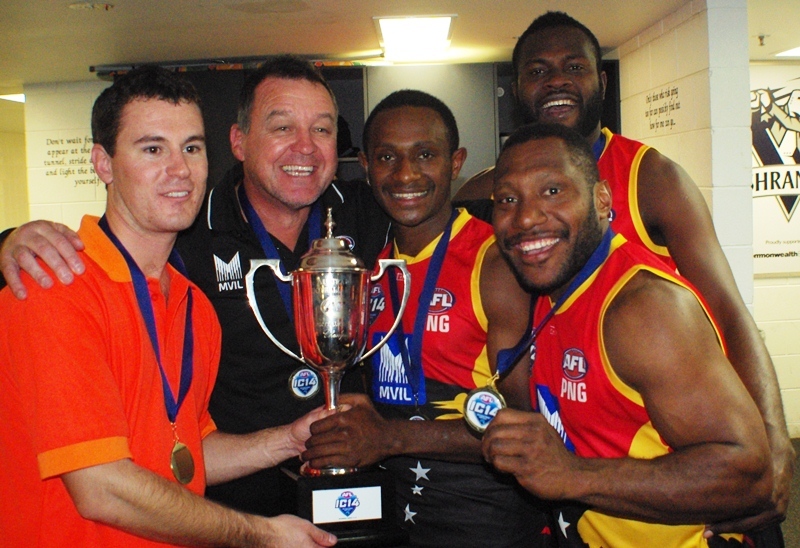 A fitting victory seeing PNG home by just three points to avenge their 2011 Grand Final loss to Ireland. A crowd or around 5000 (est.) 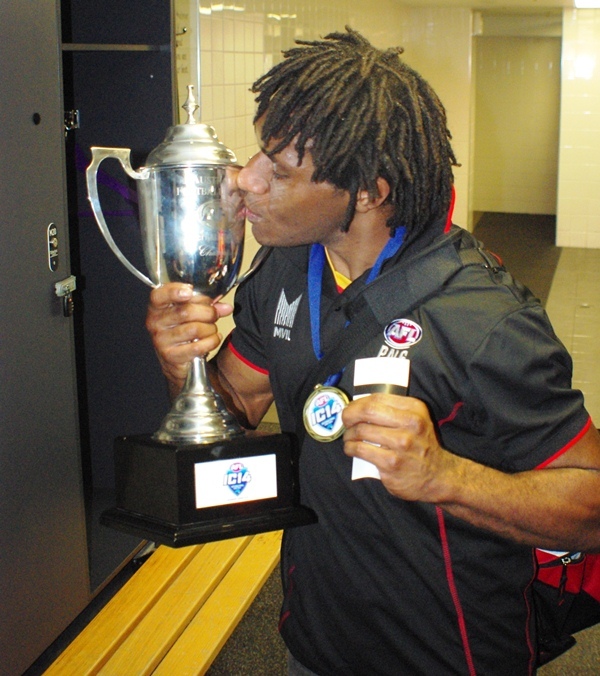 watched the Mosquitoes lift the International Cup and John Ikupu was named man of the match. Ireland: Finn, Farrell, McElhone, O’Reagan, Bartley. Best on ground John Ikupu. The goal to Beno after the 1/4 time siren appeared to be crucial for morale. PNG had a sniff then and came out much better in the 2nd. But you wouldn't want to be a forward in their team. They go backwards, sideways, forwards a bit then backwards, before finally bombing it away not to advantage. A full forward would've lead 6 six times and given up exhausted only to see it kicked to his opponent. Yet then suddenly at times there were deft little passes out in front into space. It was very PNG. If they had 2 or 3 bigger men like Ikupu they'd be runaway winners. Start searching the streets of Moresby now! 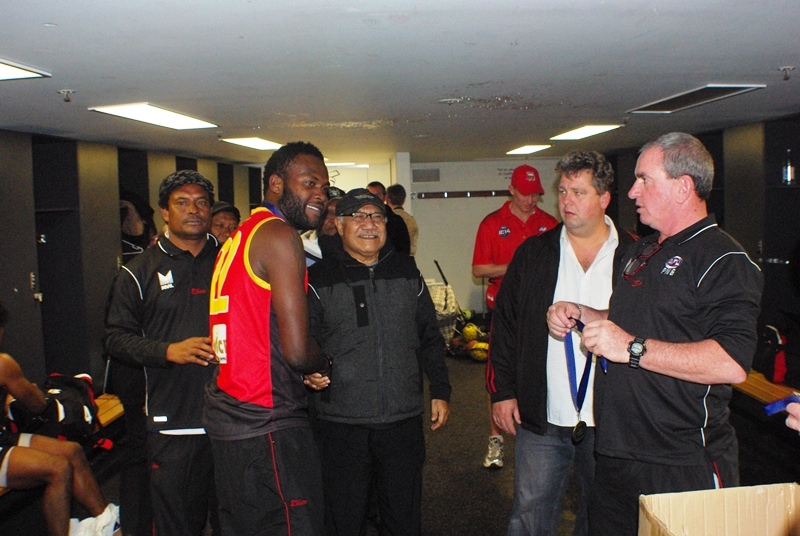 I didn't really have a favourite this time but must admit it's nice to see PNG not go 1 win 4 losses in IC finals. 2 and 3 looks much better. And now the winners list is: Ireland 2, PNG 2, NZ 1. With plenty of promise from NZ and SA. Can someone else join them? If Fiji can grow their numbers a bit more there's a lot to like about them. At times they looked like they could match it with the 2nd tier teams, and destroyed the lowest teams. Congratulations to Papua New Guinea and Ireland for putting on such a great Grand Final, and to the Mosquitoes for taking out their second International Cup title to go with their three Arafura Games titles. Exciting to see Canada take out the women's International Cup, so many men's and women's teams competing and the rise of the likes of South Africa and Fiji. Thanks for the excellent coverage WFN. I managed to watch most the game late in the week and gee the commentator was annoying relying on the IC 'record' rather than getting the team sheets. That and getting Lucey and Finn mixed up in the first as well.